Most every ecommerce merchant is at least contemplating a mobile strategy, whether a specialized mobile app or a mobile optimized site. 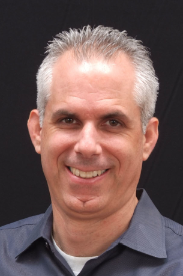 Mobile development is the topic we discussed recently with David Sasson. He is the president of OverstockArt.com, an online retailer of original painting reproductions. He is in the process of executing his company’s strategy. 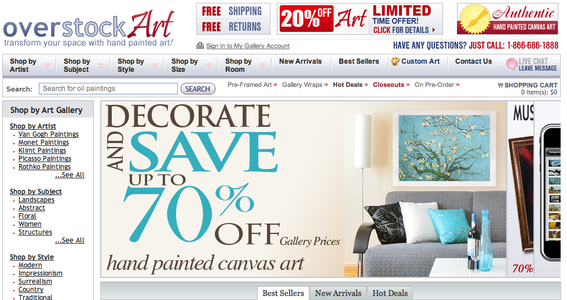 Practical eCommerce: Your company, OverstockArt.com, sells original painting reproductions. You’re a seasoned merchant, using the Yahoo! platform. What is your mobile strategy? David Sasson: “Basically, when we look at our mobile strategy, it’s embedded into our overall strategy. Our strategy in a nutshell is to do everything for growth and we found that mobile can fit well for a number of reasons. First, we like to look at the external factors when we look at a strategy, and the external factors are that smartphones are selling a lot more these days than they did a year ago. Customers are getting used to browsing with their smartphones; so you know that you’re going to have more traffic and more experienced traffic. PEC: Is your site, OverstockArt.com, optimized for mobile? PEC: Your reference earlier was that the conversion rate presently is low on mobile browsers. Is that because mobile browsers are presenting looking at a non-mobile-optimized site, which could be driving that low conversion rate? PEC: So your preference is a mobile-optimized browser versus a mobile app? Sasson: “You have to do both. If you don’t have the ability to do both, you want to think which one to do first, knowing that you’re going to do the other. “From our standpoint, we felt an iPhone [decorating] app should go first, because the mobile-optimized site is going to be a little bit of a compromise. Our site is always going to be better on the [desktop] computer than it is on the mobile device just because of the size of the screen and such things. PEC: What’s that iPhone app called? 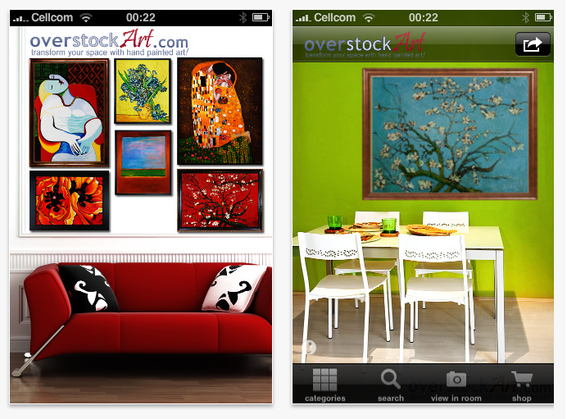 Screen captures, OverstockArt’s iPhone decorating app. PEC: With the use of their phone camera, consumers can take a picture of a wall, place one of your paintings in that image, and get an accurate representation of what that’s going to look like in their particular surroundings. Sasson: “Yes. When you start out, you get a few different walls that we put in there for you to use if you did not want to use your own wall, like if you’re buying for a friend or if you’re buying for a certain environment or you’re going to move. Then you can scroll with the different options of art on that wall. You can look at your wall and scroll the different paintings on your wall. Once you decided what you want, you would press the button, take an image and that image would be the image of your wall, and our painting is already sitting on your wall as if you bought it, to make the shopping experience more fun and more accurate until you find the right painting. PEC: For your soon-to-be launched mobile-optimized site, what sort of compromises did you have to make there? Your products are an interesting test for small screen mobile devices. They require a fair amount of scrutiny from the consumer. They are not exactly commodities. Sasson: “This is a two-part question. The screen is definitely an issue that consumers are going to have to deal with. When consumers get to a product page, they’ll see a painting and if they want to really get down and see textures, it’s going to be hard. Basically, consumers are either going to have to say, ‘I feel comfortable enough to purchase this way,’ or mark a number of items on the mobile site and then go to the main site to actually see them. That really is a compromise built into the device. I would also say that the cell phone manufacturers have continuously increased the size of the screen, so if you look at your smartphone that you had two years ago and the smartphone that you have today, typically you have a larger screen today. It is still a small screen, admittedly. Listen to the complete audio interview with David Sasson. PEC: Let’s talk about the impact of mobile on your business in the near term. How’s mobile going to affect the sales this year for OverstockArt.com? PEC: Let’s say your mobile-optimized site launches in the next month or so. What percentage of total sales will that represent? PEC: We have readers, perhaps, that say, “I don’t have the money to develop dedicated app and the prospect of hiring a developer for a mobile-optimized site worries me.” What do you say to them? Sasson: “You have to deal with your budget because we’re all in business and cash is the lifeblood of business and you have to manage your cash wisely. If you’re unable to do it, then you don’t do it. But in most cases, it’s just a question of moving funds from one investment to the other. If you’re going to spend on a thousand dollars on redoing a product page, maybe you don’t spend that, and you develop a mobile site. It depends on the platform that you have. A mobile site does not have to be very expensive. OverstockArt.com home page on a traditional, desktop browser. PEC: You’re in the process of optimizing for mobile. For our readers with a hosted shopping cart, can you give them a range of what they can expect to pay to optimize a site for a mobile device? PEC: Anything else on your mind today for our readers?